Q: How do your panels hang from the rod? A: All of the ready- made panels on the website have a 3” header and a 3” rod pocket. So they can be hung through the rod pocket or used flat and hung with rings. Custom orders can be made with a variety of top styles, please call us with any questions you have. Q: How do I measure for the panels? A: See the Measuring and Matching link on our main page for a printable diagram with all the measurements we require. A: We are north of Dallas in Plano off of Preston Rd just south of 121 in the same shopping center as Pei Wei Chinese food and next to Cowboy Chicken. Click on Contact Us for a map and exact address. Q: Do we do custom? A: Yes! Christy’s has a capable staff ready to help you with your custom project. Our talented seamstresses can do anything and we have loads of fabric options to choose from. Q: Are the panels lined? A: Yes! All the panels are lined with either a cotton or suede lining and blackout lining is available upon request for an additional fee. Q: Can you make something out of fabric I already have? Or that I saw somewhere else? A: Yes! We have a full team of seamstresses that can handle any project big or small. We would love to do the sewing for your project! Click on Workroom Services to learn more about what we do. Q: How do I clean the draperies? A: The decorative fabrics that we work with are not recommended for the washing machine, we recommend dusting or vacuuming the draperies and spraying the lining with febreeze to eliminate any odors. Q: Do you make all your products? 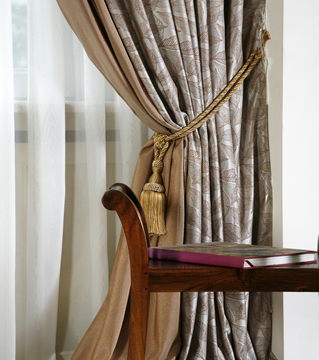 A: Christy’s has a talented team of seamstresses that make all the soft goods (draperies, valances, roman shades). The shutters, roller shades, wood blinds, and honeycombs are all made by a trusted Christy’s vendor. A: Yes! Christy’s keeps the fabric of all the panels listed on the website and will send samples out free of charge upon request. Just send us an email or give us a call. Q: Do you install the draperies? A: Locally we recommend a great installer. We can also talk you through a basic installation. A: Your card will be charged as soon as you complete the order in our shopping cart. Q: What is the cost for a design consultation in my home? A: We charge $125 to come out to your home for a consultation and measure.